Hudson River Painters of the mid 1800s, like Sanford Gifford explained their work as poetic responses to the American landscape, not factual transcriptions. While artists like Sanford traveled far exploring both American and Italian landscape motifs they often found adventure painting in their own backyard. 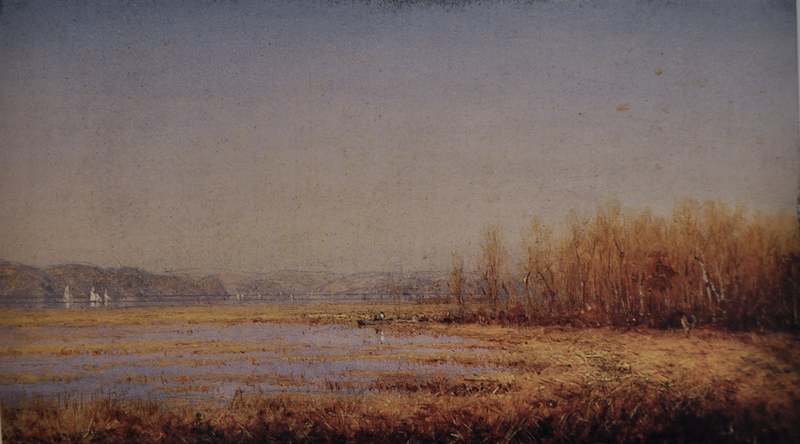 Gifford lived along the Hudson River and responded to its intimate marsh scenes with small oil sketches on board (example 1). 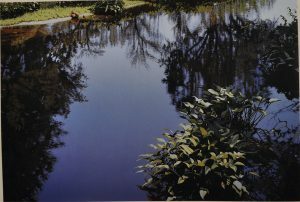 This fascination with intimate corners of nature would describe other later landscape painters from Cezanne to contemporaries like Sarah Supplee (example 2) and William Nichols (example 3). These artists shared an interest in conveying sparkling daylight dancing across natural water bodies as well as the subtle vibrations in the surface reflections. They generally preferred smaller formats well suited to presenting a feeling of an intimate space. We can experience shimmer and sparkle in all these examples. Example 1. 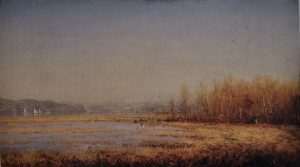 Sanford Gifford from 1876 with “Hudson River Marshes” small oil on board only 7” x 13”, perhaps a study for a later larger work. Example 2. Sarah Supplee from 1982, “Shawsheen” on a standard 22 x 33” paper sheet in gouache. Example 3. 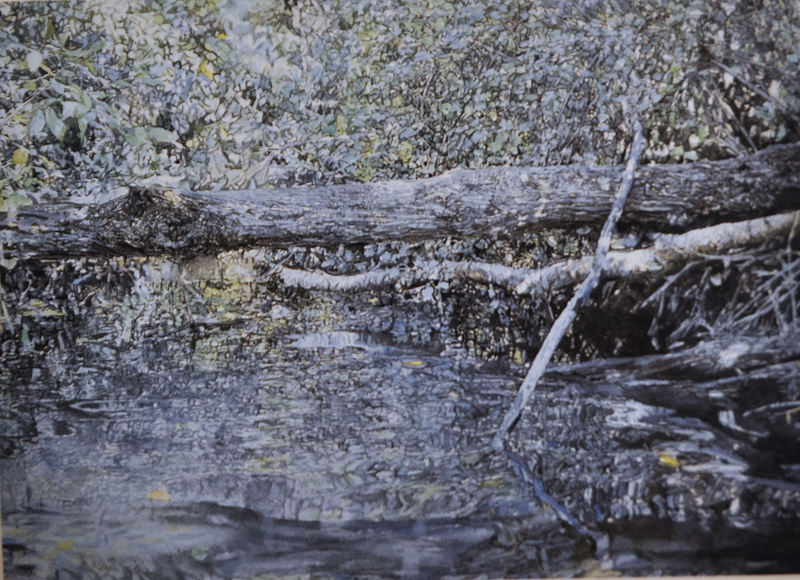 William Nichols from 1983, “Fallen Log across Bradley Creek” on 18 x 27” sheet in watercolor. My own interests in shimmer and sparkle effects led me to paint on reflective surfaces like gold leaf. Later I switched to faux enameled silver and gold surfaces applied to aluminum composites. By revealing bits of the silver substrate I am able to create sparkle effects that depend on the viewing angle of the beholder. These effects can only be experienced in person because of sparkle’s dependence on the particular surface material and the dependence on the beholder’s ever-shifting point of view. I present three examples of works currently in process (examples 4, 5, &6). They all use the enameled brushed silver aluminum surface. Each example suggests a different palette and season. Traditionally, landscape painters from Bruegel to Poussin liked to present an ensemble of the four seasons. Due to last Sunday’s winter storm The West Hartford Art League has rescheduled the Sunday workshop for this Sunday January 27th. 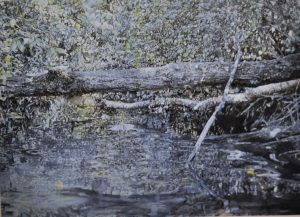 There are two new openings if you would like to attend this one day painting workshop 9 am to 4 pm. 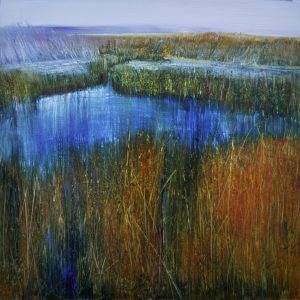 This is the 2nd day of the January painting workshop, Natural Elements. You may register on line at the West Hartford Art League’s website or call the registrar at 860 231 9019 ext#2. 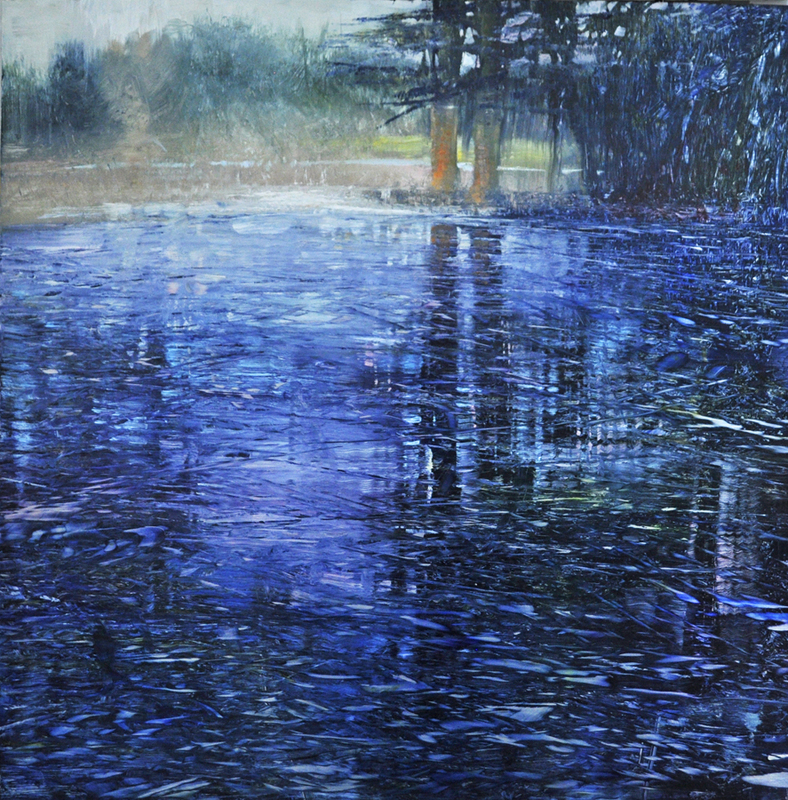 Each painting is just beautiful. Sparkle is so enticing and electric. Magic. 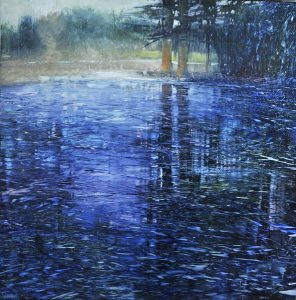 There is so much to know in the world of art and I always learn something reading your words and especially looking at your paintings. 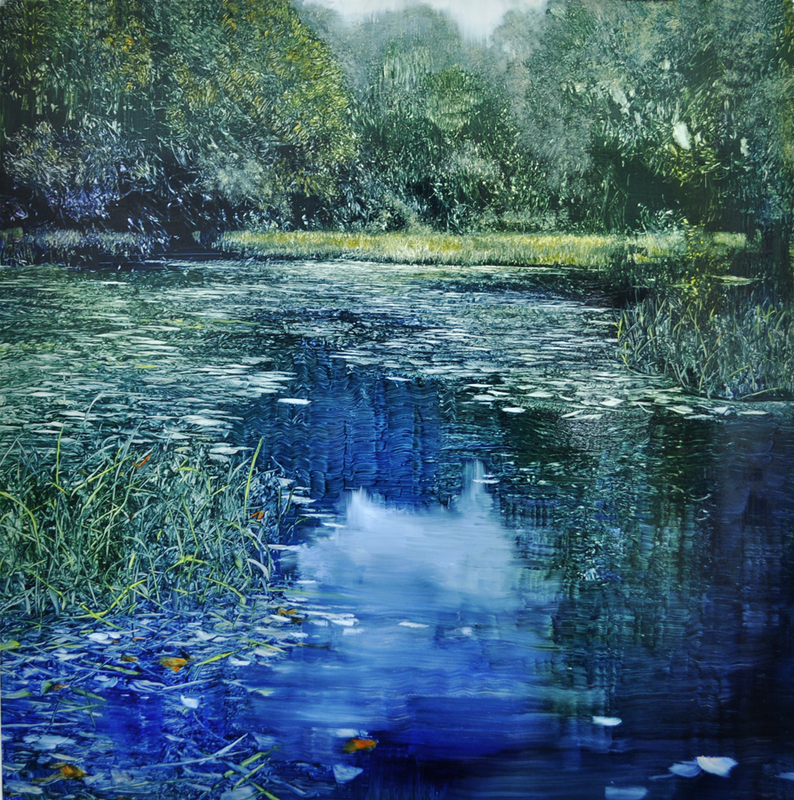 Beautiful, beautiful paintings. I don’t often comment, but always eagerly read your blogs. Your ability to draw the essential thread from great masters of the past to your contemporary work is priceless. It has helped me as an artist to develop more confidence and understand ways to build on my own work. You are a gifted teacher as well as artist. Thank you for sharing your knowledge and insight. I hugely appreciate your kind sharing…..perhaps one day you will come to Hamburg,Germany , and teach for a week…..I will surely attend ! ALL of your blogs are wonderful ! Thank you !